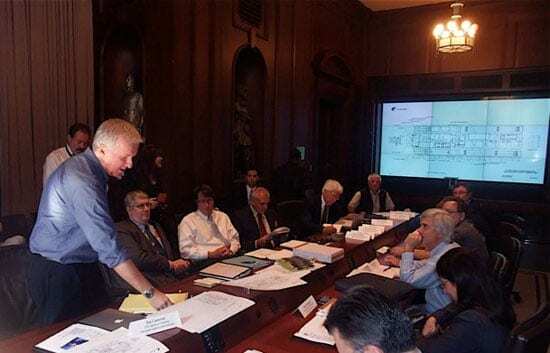 On June 1, 2010, members of the staff of the Woods Hole Oceanographic Institution (WHOI) participated in a meeting at the Environmental Protection Agency headquarters in Washington, D.C., to consider possible alternative solutions to capping or controlling the flow of oil from the Deepwater Horizon well in the Gulf of Mexico. The conclusions and recommendations of the Deep Ocean Task Force, the ad hoc group initiated and convened by director James Cameron, are now available online at www.whoi.edu/topic/oilspills. The ad hoc group included twenty-eight experts in deep ocean engineering and exploration from the marine industry, government agencies, ocean advocacy, and oceanographic research organizations. An independent research institution, WHOI is a leader in oceanographic research and engineering at all ocean depths and has four decades of experience conducting and managing the science of oil spills. WHOI is home to the National Deep Submergence Facility (NDSF), which operates deep-sea exploration vehicles for the benefit of the entire U.S. oceanographic community. WHOI participants included Rob Munier, vice president for Marine Facilities and Operations; David Gallo, director of special projects; Bill Lange, the director of the WHOI Advanced Imaging and Visualization Lab; and Dana Yoerger, a senior scientist and developer of remotely operated and autonomous underwater vehicles. The ad hoc group also discussed the research needs to characterize, monitor and assess the impacts of the spill as well as a framework for response preparedness for future spills. Among the steps discussed were the deployment of long-term undersea environmental monitoring systems, the establishment of environmental baselines, and the design and development of a rapid response capability. The summary report was published with the intention of stimulating discussion across a wide area of expertise in offshore oil production, oceanography and ocean engineering. A date for the group’s next meeting, which will be held at the Woods Hole Oceanographic Institution, has not yet been set.